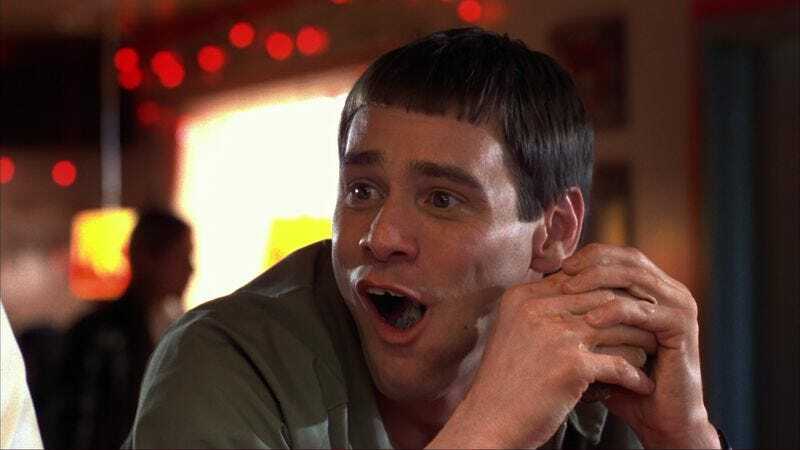 Anyway, while the idea of a Bruce Almighty sequel would seem like a non-starter after the box-office failure of Evan Almighty was so spectacular, it sent director Tom Shadyac into an existential tailspin, this isn’t the first time we’ve heard talk of another Dumb And Dumber. Back in February, the Farrelly Brothers said that the “ball is in motion” for a proper follow-up that would erase any lingering memory of the prequel Dumb And Dumberer: When Harry Met Lloyd, provided they could interest Carrey and Jeff Daniels in returning. So it would appear that Carrey is on board, at least theoretically; now it’s up to producers to convince Jeff Daniels that the comedy of explosive diarrhea would be the perfect counterbalance to winding his way through Aaron Sorkin’s monologues.